She looks for the perfect video to play for her guests to set the mood. Does anyone remember the ‘Green Fingers’ episode of Night Gallery? And the classic, “Everything I plant grows, even me”. You will never listen to the song Greensleeves in quite the same way after watching! Then the gardener turns the lights back on and brings out some of her gardening books. Everyone takes turns reading from Wicked Plants by Amy Stewart (Algonquin Books). The gardener has pre-selected several readings that are particularly frightening including “Lawn of Death” which includes the story of Cogon grass which is sharp enough to cut a cow’s tongue and lips. Oh, my, what the government can do! Truly scary! Then there’s the Stinging Tree, Dendorcnide moroiddes, found in Australian. It's guaranted to make you itch, imagining how the pain of its sting could drive a person to the edge of madness and beyond. And to really scare her guests, the gardener reads the story of the deadly poisonous Monkshood, Aconitum napellus, which was mistakenly served at a dinner party, killing two guests. I highly recommend reading this book any time of the year. 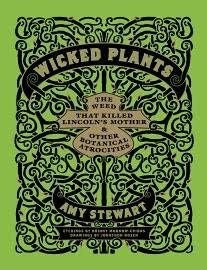 Gardeners, and non-gardeners, too, will enjoy reading the stories that Amy has to tell us about the wicked ways of plants. Before the witching hour arrives, the gardener next invites guests to browse through Black Plants, by Paul Bonine (Timber Press), paying particular attention to the pictures of the orchid, Dracula vampira and the Devil’s Dracula orchid, Dracula diabola, which look as sinister and odd as their names imply. Seeing 'Queen of the Nile' tulips listed in Black Plants reminds the gardener that she wrote about the possibility of handing out tulip bulbs to trick-or-treaters in her weekly newspaper column. But she doesn't really hand out tulip bulbs, she really hands out candy, and lots of it. 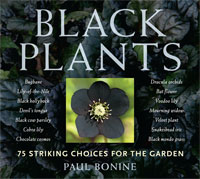 If you want to add dark blooms for contrast in your garden, grow some very novel plants, or plant an entire garden with a dark color theme, Black Plants is a great resource to have on hand. The gardener leads all her guests outside to scatter candy around the garden and wait for the Halloween Hare. 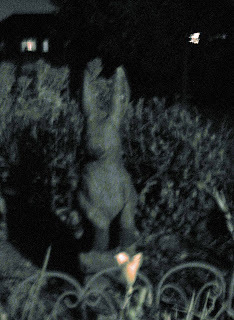 Since sightings are rare, after a few scary moments listening to leaves rustle and the far off mournful howl of a dog, the shivering guests gather up all the candy, leaving a few pieces just in case, and head out into the night, with images of antique gardeners, wicked plants, black blooms and the mysterious Halloween Hare destined to keep them awake until dawn. Then the gardener goes back inside to clean up the party mess and remembers that she should have told her guests that the two books used for the Halloween party were provided to her as review copies from the publishers to do with as she wished. They didn’t ask, insist, cajole, or hound her for reviews or threaten to trick her if she didn’t treat these books well! What a tease you are, Carol! I was just getting into this video when it ended...now I'm going to have to hunt for the whole episode to see how it ends. Would it sound too evil of me to say I hope Mr. Saunders winds up as fertilizer for the roses? Rose, when I first watched part 1, it automatically went to part 2, then 3. But I can see it doesn't always do that, so I've added the other two parts to the post! I'm not giving away what happens to Mr. Saunders! It all sounds suitably spooky. When should we arrive? We'll all bring our pitchforks and spades. Delightful! Thanks for the smile! Happy Halloween! Carol, that was great. Old ladies fingers...perfect. It's a good one. I watched all three parts while having a break from cleaning the garden. Well, I am not sure I want to go back there right now. What if I see something spooky growing... It's a very good pre-Halloween post! I didn't remember that episode, but I do remember one from Alfred Hitchcock Presents about a Rose bush that flourished because it was planted over a corpse the murder was hiding. It was all that "organic matter" that made the Rose grow so well. Very scary, esp the black tulip. Clever post. i second the clever post comment. you really set the mood - love it! what a blast from the past. Thanks for sharing. I don't think I've seen a true black flower. I bet the photographs in the that book are amazing - at least the cover is. Huge fan of Rod Serling's Twilight Zone and Night Gallery, Carol. That episode was one that I missed but it was very good. Such a great writer and one who died so very young, unfortunately.